Thought I would start this so I had somewhere to post non-rookie information through the offseason. Will also give a run down of all the teams in one of the first few posts. And a look at the NFL Free Agents & Also teams current depth charts. Wow - with NP looking to bounce back (and having a bloody good squad) as well as the Hammers improving all the time, that Herbert Division is going to be fudging hard to get out of. yep we lucked out there! Tough division. We could run expansion of this league, I have an idea for how it might work (adding 2 teams), alternatively there might be a slot in another league I run as well. 1) Run the Rookie Draft with the current teams, as picks already traded etc, would be harsh to change where those picks are. i) Tm A picks 1 from Usos, Tm B picks 1 from Troopers. After those 5 rounds, the picks from the New teams would open to ALL Players for 5 further rounds, while current teams can only pick from their own squads or Free Agents. I will run some more testing on this ensuring it looks to be the fairest process while not punishing the current teams too harshly, Tegal is going to help me with this as well. The other alternative is that we postpone expansion til 2017, and we work out a method that means we all know in advance what the draft picks are worth etc. So while this hurts the top teams the most, that is actually pretty well balanced out. I'm sure you'll guys will work this out in testing, but just wondering if round picks 6-10 should be snaked - i.e. Could maybe also swap it around so that teams 3&4 lose 10th best while 1&2 lose 9th. It just seems to me that with only protecting one player each, a top team losing their 2nd & 6th best players is by far and away worse than the 9th place team losing 5th & 10th. The original plan would probably end up making the league much more even which could be argued as not fair to the teams who have done well to date. Obviously I'm not exactly impartial in this and it could be that I'm just being one-eyed. Will look into that. It's a balancing act for sure. excel spreadsheets are making me go cross eyed. Myself & Tegal have done some experimenting over the weekend and early part of the week. I'll send out and email to the whole league shortly (Some point today, depends on amount of work I have), explaining how the process would work and then on how we go from here. I would like to get majority support before going ahead with it. So people know we tried straight & snake variants, we tried expanison teams at the start of rounds, in the middle, with all teams protecting a player first, with selections from any team in the final 5/10 rounds and a few others. Some of them were good, but had one team get hurt badly, or in one case a team moving up 3 spots in rank, or the expansion teams ended up as the #2 & #4 teams (Too high). We don't need to make a decision until our rookie draft, but for making it easier on myself I would like it if we could come to agreement sooner rather than later. So Justin Tucker, Alshon Jeffery & Kirk Cousins all on Franchise tag, other teams can offer long contracts to them, BUT would have to give up two 1st rounds picks (2016/2017), can't see that happening for any of them. 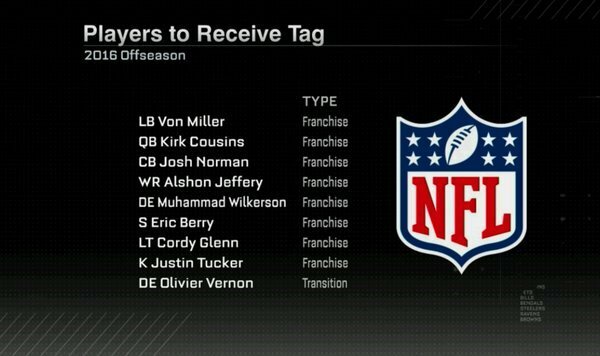 Von Miller is on Exclusive Tag so other teams can't get him. Nice work lads, I'm sure we can all live with whatever is decided. With Patrick joining, I'm not sure if you've got someone in mind for the 12th team, but my mate is still very much keen. Top of the table. Nice. saw the email, got confused and then had a lie down. No idea what I am supposed to do but Jono - you have been a leg end in organising all of this so I trust your judgement on whatever changes you want to make.